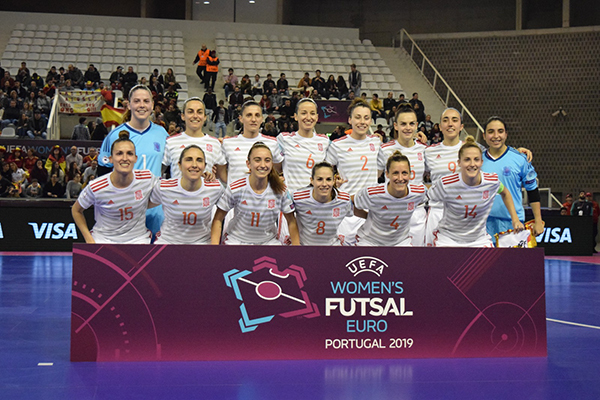 In front of 845 futsal fans Russia and Spain inaugurated the first ever UEFA Futsal Women's EURO Finals in the Gondomar Multiusos venue. The high tension given by such an historical event for the girls five-a-side game meant quite a soporific first half, in which both squads could not offer their best. Few chances to score, but Spain could take the lead thanks to Vane Sotelo who enjoyed a lazy russian defence to beat Ivanova. Second big russian mistake, second goal: Ivanova and Krupina tried to stop Ame Romero in the wrong way, own goal by Russia's #8. No game at all in the second half, as Russia didn't provide the game with any sign of reaction and just suffered passively the iberian game. Luci, Ame Romero and Irene Samper increased Spain lead until the definitive 0-5. No game in Gondomar. one of the worst ever versions of Russia in recent times, not the best timing for this. Meeting with futsal story for Spain on sunday, as they will face Portugal or Ukraine in final.